Voted "Best Wedding Destination of Rural Missouri! 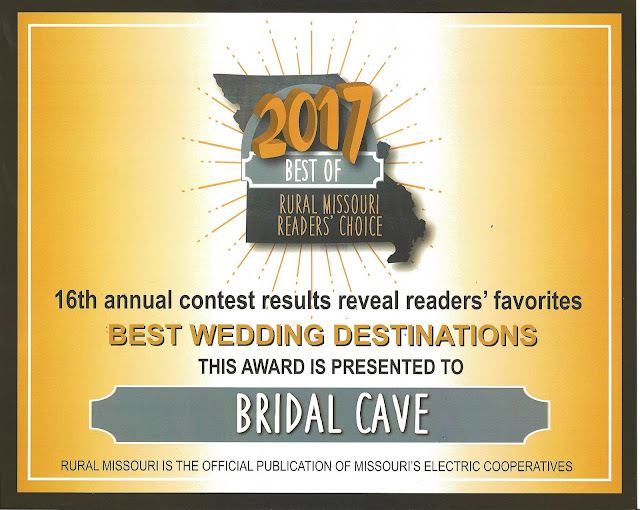 We're so excited and honored to announce that we've been voted the "Best Wedding Destination of Rural Missouri" for 2017 by Rural Missouri Magazine! Thank you to all who made this possible for us. We couldn't be where we are today without the love and support of our guests and community! To date, we have had 3,548 weddings so far. This year is starting out on a record pace with six weddings planned for the first week of April alone! If you've recently got engaged and are looking for a wedding venue at the Lake of the Ozarks, we'd be happy to accommodate your needs. Number of Guests The chapel inside the cave can accommodate up to 50 guests standing room and the outdoor pavilion overlooking the Lake of the Ozarks holds up to 80 guests seated. There are lots of exciting activities to enjoy when you're looking for family fun at the Lake of the Ozarks. One of these happens to be fishing, and our great big gorgeous body of water offers some of the best fishing in the nation. From bass to catfish to sun perch, there is a fish for everyone's liking. The Lake of the Ozarks contains over 64 billion gallons of water and covers more than 54,000 acres. That's a lot of room to hold lots and lots of fish! 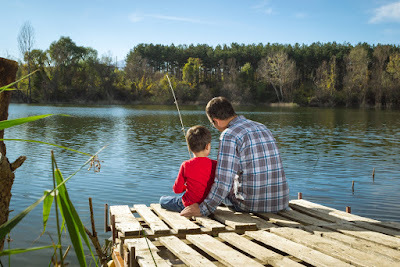 Whether you are an experienced angler or a newbie to the sport, you can find tons of incredible fishing spots in and around the lake. The fish have plenty of natural habitats to thrive in, and local residents do their best to provide artificial ones too, giving the fish an assortment of places to live. As a matter of fact, every January Bridal Cave & Thunder Mountain Park collect used Christmas trees and distribute them into the lake, helping to keep fishing in the area plentiful. Why a Boat Dock First? 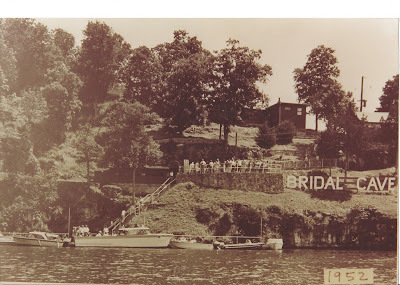 When the excavation of Bridal Cave's entrance started in the spring of 1948, there were no roads in the area yet. Two separate crews worked simultaneously to get the park opened. The first crew started their work at the old highway 5, where the built a road and parking lots, and also installed power lines. The second crew was hired to excavate the cave entrance, but the only way for them to reach the cave was by boat. Without that initial boat dock, they wouldn't have been able to get to work each morning. It's time for Spring Break! You don't need to travel to some sandy beach to get away from everything. Our scenic Lake of the Ozarks attraction feels lucky to be located in the center of some of the most natural beauty in America. There's no need to travel any further than right here, the Midwest's Coast! There are buds on the trees and the flowers are beginning to bloom, the fish are biting, and the lake is calling out to us all! Bridal Cave & Thunder Mountain Park are even extending our hours to kick off Spring Break, and we'll be open daily from 9:00 am - 5:00 pm beginning March 11, 2017. In addition to spending a day or two exploring all of the amazing things to discover at the park, there are plenty of other things to do at the lake to keep you entertained all week long. Calling All Rock Hounds... The NEW Sluice Has Arrived! 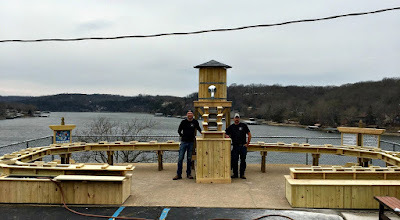 If you have already visited our scenic family attraction at the Lake of the Ozarks, you saw a great big contraption next to the front door of the gift shop entrance. That was our sluice, which over one half million Bridal Cave & Thunder Mountain Park guests enjoyed for the past 10 years. We say "was" because it is no longer there. Not to worry, though, because we've replaced this visitor favorite with an even bigger, even better sluice. Just in case you aren't familiar with what we are talking about, here is an explanation. A sluice is a water channel that is controlled at the head by a gate. When the gate is lifted, water flows from a tower through the sluice. Guests are invited to dump a sluice bag full of sand (and more) into the channel of clear, pristine water and pan for the gemstones which are hidden within the sand.